You’ve created something to fall back on just in case you accidentally mess up your current work. You’ve created a starting point should you need to rush out the door and return later. Tap the Save icon in the screen’s top-left corner. The Save icon, which resembles a 25-year-old floppy disk, fetches the Save As window. Choose a location for your document. 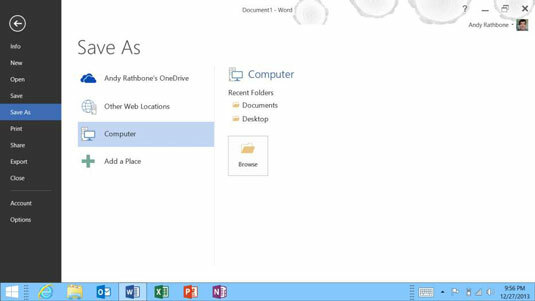 These locations await you: OneDrive, Other web Locations, Computer, or Add a Place. Choose OneDrive if you plan on accessing the document from other computers or sharing it online with others. To keep it on your Surface or to e-mail it to others, choose Computer and then select My Documents as your final destination. Every program and app on your Surface can easily access files stored inside that folder. Choose a name for your document and tap the Save button. Your helpful program offers a generic name, such as Presentation1, which certainly won’t help you locate your work. Change the suggested name to something more descriptive that will help you find the document next week.